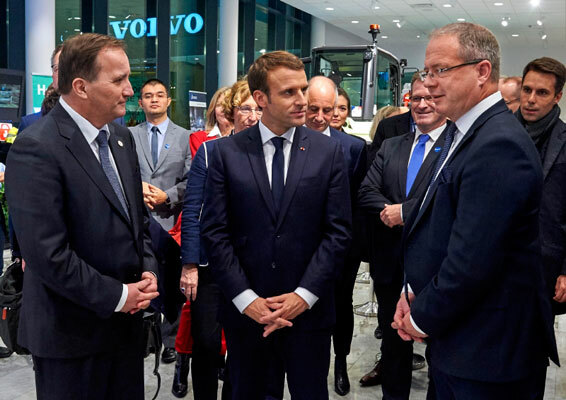 Swedish Prime Minister Stefan Löfven and French President Emmanuel Macron visited the Volvo Group headquarters where they saw some of the company’s latest innovations – including the prototype, fully-electric EX2 compact excavator. From left: Swedish Prime Minister Stefan Löfven, French President Emmanuel Macron and Martin Lundstedt, President and CEO of the Volvo Group, at the Volvo Group headquarters in Gothenburg. The Swedish Prime Minister Stefan Löfven and the French President Emmanuel Macron signed a strategic partnership between their two countries for innovation, digital transformation and green solutions at the Volvo Group headquarters in Gothenburg, Sweden, on Friday November 17th. The ceremony was held at the Volvo Group offices where they also met with Martin Lundstedt, President and CEO of the Volvo Group, and viewed some of the company’s latest innovations – including the EX2 all-electric compact excavator, an autonomous refuse truck and an electric bus. From left: Ahcène Nedjimi, Electromobility Specialist and EX2 Project Leader at Volvo Construction Equipment, discussed the company's prototype, fully-electric EX2 compact excavator with the French President, Emmanuel Macron. The EX2 is a 100% electric compact excavator prototype that delivers zero emissions, 10 times higher efficiency, 10 times lower noise levels and reduced total cost of ownership, compared to its conventional counterparts. It is believed to be the world’s first fully-electric compact excavator prototype. The EX2 is part of a research project and is not commercially available. “Prime Minister Löfven and President Macron were interested in the machine’s performance and how it compared to a conventional compact excavator,” says Ahcène, who is a French citizen. “We discussed how it could shape the cities of tomorrow and what it could do for society. The French government plans to end sales of petrol and diesel vehicles by 2040 as part of its plans to meet the Paris climate accord targets. I think with the EX2, President Macron could see that Volvo CE is also working towards sustainable development. The electrification of construction equipment will produce cleaner, quieter and more efficient machines – this represents the future of our industry. Volvo Construction Equipment presented the prototype, fully-electric EX2 compact excavator to the Swedish Prime Minister Stefan Löfven and French President Emmanuel Macron. 1. Green solutions for transport, clean energy and smart cities. 2. Green financing for climate-resilient economies. 3. Digital transformation, smart industries and startups. 4. Health and life sciences innovation.